Last Sunday, on our weekly trip to Target, Andrew asked if we could go on a Spring Break vacation. We were amused and asked him where he wanted to go on this vacation. Without pause he quickly told us San Diego was his dream destination. We questioned him on why San Diego and he, quite logically, informed us that Sea World is there and he would like to see the dolphins. We were entertained. Instead of just telling him that we don't actually get a Spring Break in our lines of work, we told him that traveling to San Diego would cost a lot of money and that mommy and daddy would need to talk about it. An hour later, on our way home from said Target excursion, he asked if we'd had time to consider his request and what was our decision about Spring Break in San Diego. This should have been our first sign that he wasn't going to let this one go. But, no. We're still not getting up early enough to keep up with him. This is what came home from school yesterday, amidst his pile of papers about Dr. Seuss and Dental Health Month. In the interest of time - yours - allow me to translate. 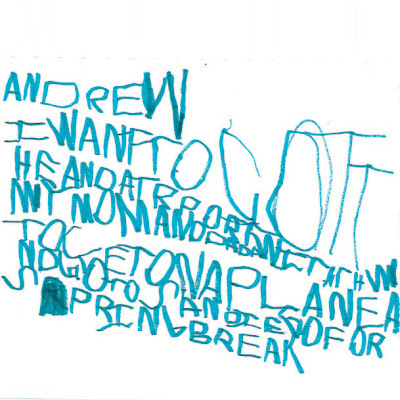 This is a note, in Andrew's very best penmanship, that informs us in writing of his burning desire to go to the airport, get on an airplane and go to San Diego with his mom and dad for Spring Break. You can imagine that his teacher could hardly wait to ask me this morning if I'd had a chance to look through his papers from yesterday. Needless to say, the staff of the Pre 2 room at Stepping Stones was amused. I'm told that this represents approximately 20 minutes of careful copying of his teacher's draft, letter by painstaking letter. We really worry about this kid. When might he learn to let us know how he feels? I feel like I just got that coveted invite to a party that everyone else has been attending for years. Mark has relented and allowed me access to hondo.org. I have RSVP'd to the invitation and this is my blogging debut. I've arrived at this party without a gift for the host but I've brought kid pictures. Who doesn't love to look at photos of someone else's kid at a big party? What? You don't? But wait, my kids are really cute. Just humor me. T is so cute that he got away with hijacking his brother's post-dinner cereal snack last week. T's motto goes something like, "If it isn't pinned down and my brother's in timeout, I shall eat it. You know you won't stop me." A is so cute that he keeps landing himself in timeout at dinner. Oh wait, that's not actually so cute. It is, however, pretty cute that he's set-up a practice skateboard ramp in the basement where he uses a sheet of paper to work on his moves. He's anxiously awa iting warmer weather so he can visit the skate park and watch the experts. There are very few subjects on which he doesn't currently consider himself to be the expert so we're encouraging this. That's all I've got for now but I hope to be invited back. It appears that my host invited me as a one-time guest with little editing power so I'm off to try and wrangle an invitation that will yield some creative control.